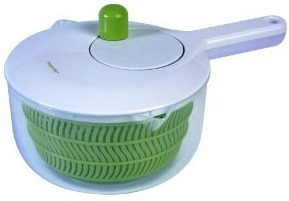 It’s such a simple concept, the salad spinner. Wash your cut greens in its bowl, strain it in the built in strainer, and then spin, spin, spin to get a clean and dry salad in no time. My particular salad spinner is nothing special. It was less than $10 from Amazon, but I just love it. I get lots of cut greens from my CSA, and after I forgot to put away some mustard greens last summer and they were ruined, it was time to stop the insanity and figure out a better way. The simple salad spinner is a better way, and, once your greens are clean and dry, they can be stored in the strainer bowl inside the spinner for a longer shelf life in the fridge. Genius! 2Chili and I are off skiing it up today, and wish you a happy New Year’s Eve. Please be safe out there! It’s like they say, the 12th time’s the charm. Oh, they don’t say that? Well, I guess I am taking some liberty with the saying, then. Back when I started No Meat November, I set off on a mission to find a reasonable replacement for beef burgers. I used to like Gardenburgers in college, but have since learned to steer clear of pretty much any processed vegetarian fare, as it has more salt than a square acre in the Bonneville Salt Flats. Okay, that’s an exaggeration, but you get the point. Processed food = salty. For this week’s Test Kitchen Tuesday, 2Chili provided the recipe he wanted. I was completely shocked that it was a veggie burger, because the boy has suffered through quite a few disastrous veggie burgers. 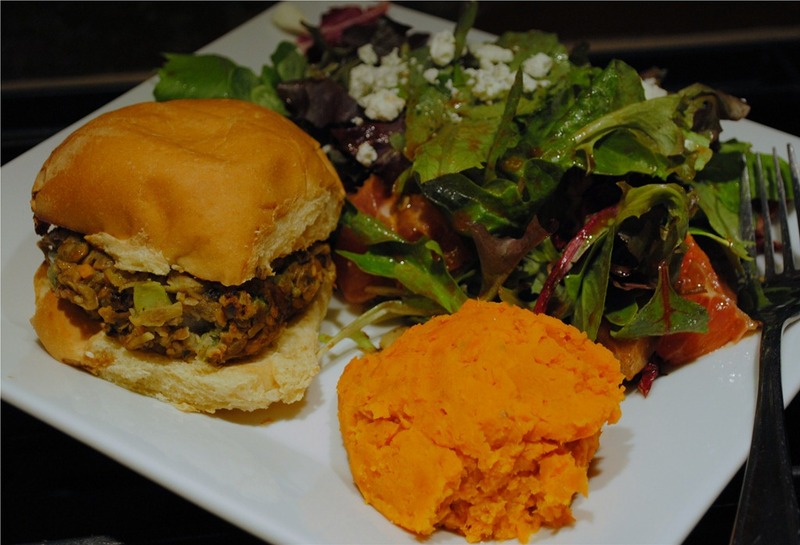 We’ve tried multiple black bean burgers, lentil burgers till the cows come home (ironic choice of wording, huh? ), and the one I thought was the best, a TVP (textured vegetable protein) burger. For what it’s worth, 2Chili thought the TVP burger was the worst. We couldn’t be more different. Last week, he handed me a magazine that our realtor sends out called “American Lifestyle.” It was opened to a recipe for Red Lentil Veggie Burgers, garlicky yam fries and spicy mango ketchup. Of course, for 2Chili, yam fries and spicy mango ketchup were not contenders, but he suggested the lentil burger. I happened to have all the ingredients required on hand, and even had lentils and bulgur prepared. It was veggie burger destiny. The burgers are chock-full of chopped veggies, and thus take a bit of prep time, so this is a good make ahead on the weekend project, which is what I did. Last night, all I had to do was heat them up and add some mashed potatoes on the side. I had very low expectations for these burgers, as I am used to the disappointment of providing what I think is a good veggie burger only to get two thumbs down. But, amazingly, he had his dinner eaten before I even finished assembling mine, and I didn’t hear any rumbling in the other room. In 2Chili land, that means something was a hit! Original Recipe Inspiration: The recipe is a modification of “Red Lentil Veggie Burgers” from a magazine called American Lifestyle. For one patty made with no added salt. Click to enlarge. The Verdict: 2Chili said this is the best at-home veggie burger he has had yet. These were somewhat laborious due to all the chopping, but, the end result really was good. The original recipe didn’t call for an egg, but after trying to get them to hold together somewhat unsuccessfully, I added the egg and that seemed to do the trick., as they held together pretty well. 2Chili thought they were good because all the veggies gave them a bit of a crunch, instead how he described previous veggie burgers, “pasty.” Since there are only two of us, I froze 6 patties, so we’re set on veggie burgers for a while. Gotta love healthy convenience foods! If you’ve followed TKT for a while, you may know that my love and admiration for the butternut squash is bested only by my love and admiration for the sweet potato. It honestly can’t be repeated enough. Winter squash is wonderfully diverse, and useful for just about any occasion from soup to smoothies. I like to roast up a couple varieties at a time, cut them into cubes, and freeze them for convenient access any time inspiration strikes. Acorn and delicata are two other really good varieties, in addition to the effervescent pumpkin, of course. 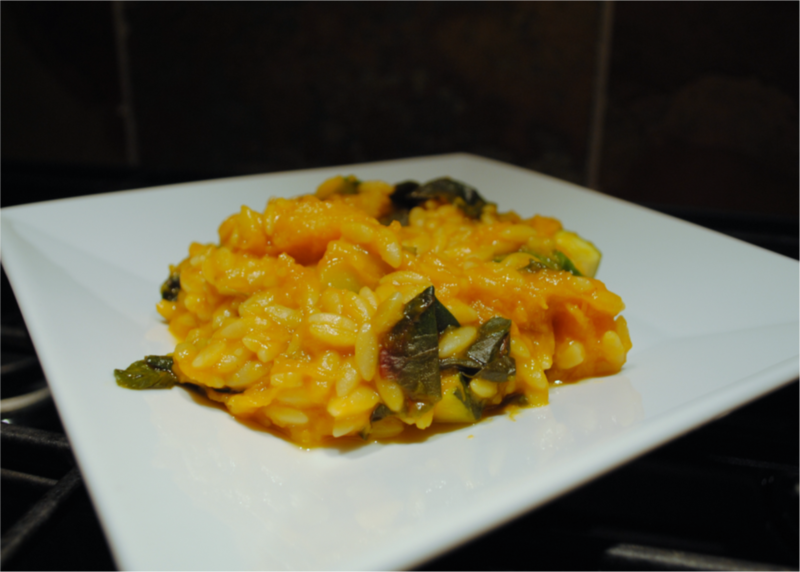 The idea for this recipe came from a successful attempt to make a risotto-like orzo a few weeks ago. For some reason, I had a hankering for risotto but all we had was orzo. Turns out, you can cook orzo in vegetable broth to a creamy consistency without all that stirring. Last night, when I wanted something with orzo, I was thinking more along the lines of a soup, but ended up with a nice pasta dish. I started with orzo and veggie broth, and picked a few items from the crisper to complement them. As it turned out, I didn’t have quite enough broth for a soup and am glad! It was serendipity, you might say. While I didn’t serve this to 2Chili, after having it myself, I’m confident this is something he would like. It’s going to be on the leftover rotation for him (mwa-ha-hah). This is super easy and fast, and provides a hearty and satisfying dinner. Served with a mixed greens salad, it was really perfect for a cold and wet night (which, let’s be honest, is every night in winter in the Northwest). Did you survive the holidays? Or perhaps a more appropriate question is, do your pants still button? I did, and mine do, so I guess that is what we’d call a holiday victory indeed! Have you ever looked at the nutrition of your favorite store-bought or coffeehouse muffin? If you haven’t and decide to, better put on some kneepads ahead of time, because I’m pretty sure you’ll be so shocked you’ll hit your knees. 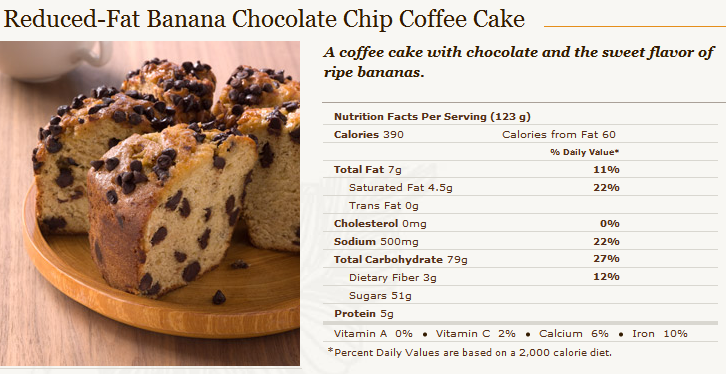 While technically not a muffin, I used to think the Starbucks reduced fat banana chocolate chip coffeecake was a pretty decent “muffin-like” selection. Uh, yeah, not so much. Sure, it doesn’t have much fat, but holy Chiquita bananas, it has almost 13 teaspoons of sugar, and 1/4 off your daily allowance in sodium! The day I looked this up (after having a piece), I spent an extra hour on the treadmill trying to undo my mistake. Those nutrient-dense cranberry quinoa muffins from last week got my mind churning. If instead of a sugar delivery system, muffins were more of a nutrient delivery system, how awesome would that be? And, if I found a way to make that nutritious muffin, with oh, I don’t know, sweet potatoes, how much even more awesome would that be? With the holidays (and holiday treats) now solidly in the past, it seemed apropos to develop a truly healthy and hearty muffin that seems a bit like a splurge, but isn’t. Alas, I present you with a Test Kitchen Tuesday original, straight from my noggin to your table, the sweet potato muffin. 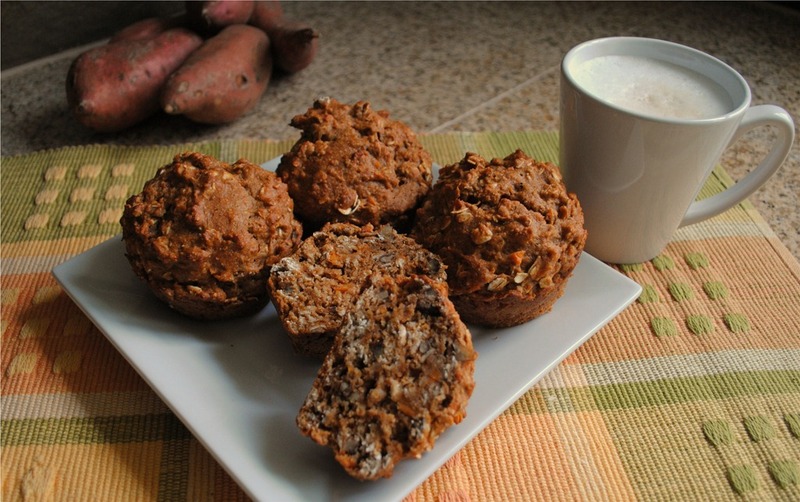 These muffins are a good source of vitamin A (190% DV!! ), Fiber (7g), are relatively low in sugar for a muffin (18g) and have a decent amount of protein (8.2g). I did my best on the sodium front, and a jumbo muffin netted out at 387mg. The pesky sodium sneaks in because you have to add something to make them rise a bit (in this case, baking soda). A final note about sugar. I only added the bare minimum in the way of sugar. I like to add a schmear of almond butter or reduced fat cream cheese to mine. You may feel you need to add more sugar, in which case, I would suggest that you try to only go up to 1/3 cup of brown sugar or 1/2 cup tops. Or better yet, keep with the bare minimum first, and see how it goes. Please, for me. And, since we are bloggy BFFs, I know you’ll listen, right?! When the potatoes are soft from microwaving, drain water and add them to a blender or food processor with 1 cup of milk and puree until smooth. For jumbo muffins. Split data in half for regular muffins. This post could also be called, the ugliest plate of sugar cookies, ever, but that didn’t have the best ring to it! Considering today is Christmas Eve, and most people don’t really want to hear about healthy eating right before they hit friends and family’s homes for holiday dining, I thought I would have a guest Friday Favorite. You see, I am not much into holiday food (I know, just call me the Grinch). But, 2Chili is more like normal people in this area, as he does enjoy his holiday dining traditions. The wheels fell off at the frosting! 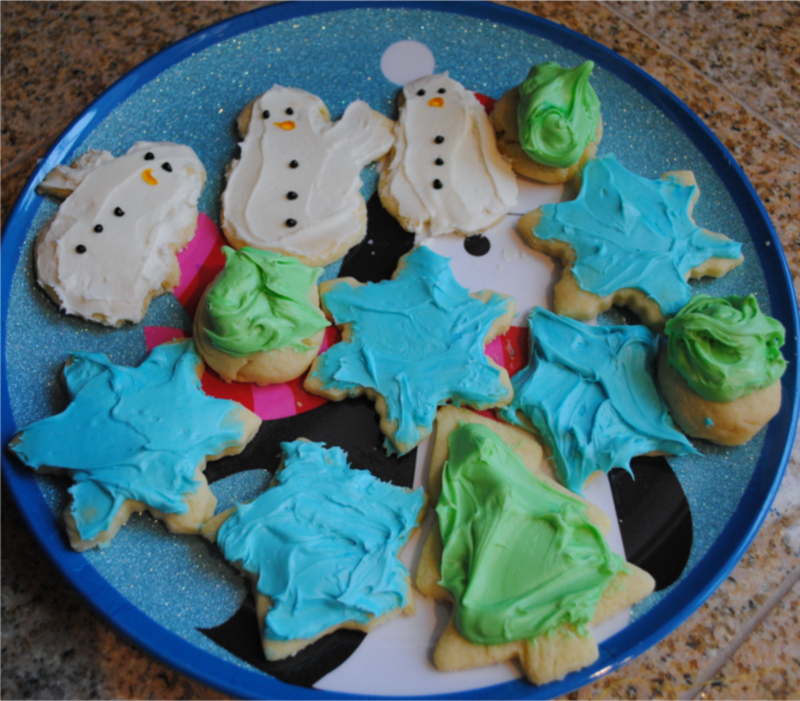 My cookies look like a 3rd grader decorated them, but they taste pretty good! Ah well, much like the dog biscuits I made a while back for Pipa, 2Chili doesn’t care how they look, he just cares how they taste. 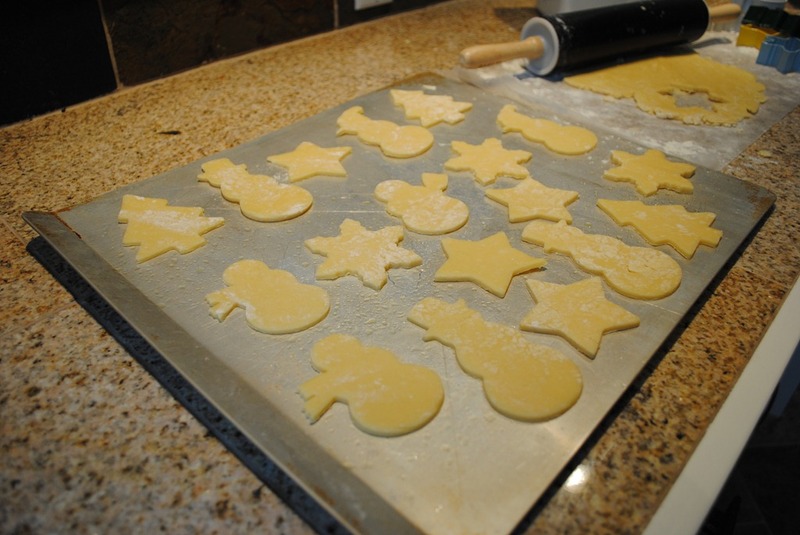 Good thing, too, cause I would be kicked off Iron Chef in 2 seconds with a sorry plate of cookies like these! 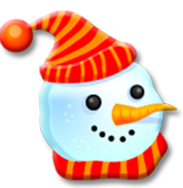 Wishing you a happy and safe holiday, and sending warm season’s greetings! 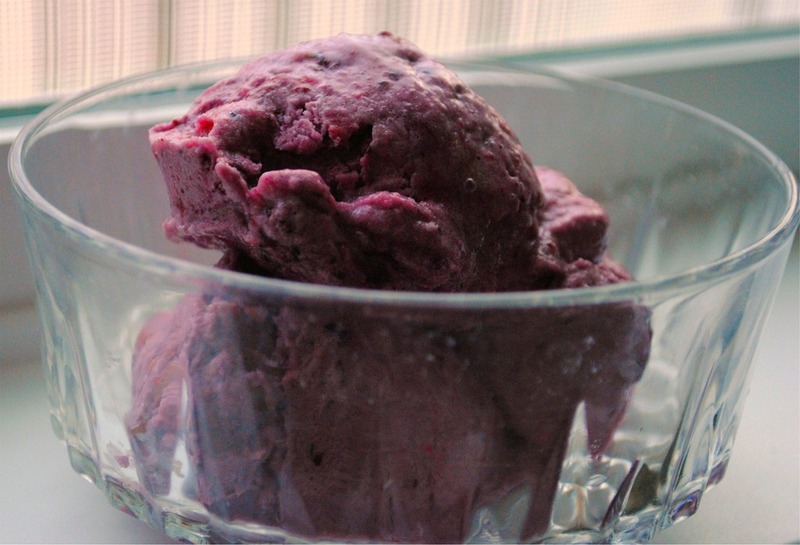 When I was young, my grandmother made the absolute best homemade strawberry ice cream. It was a big production that involved an old fashioned ice cream maker, rock salt, and I honestly don’t know what else besides strawberries – and, I probably don’t want to know. There must have been heavy cream somewhere, because that ice cream was the most delicious, creamy, sugary concoction ever. In the heart of Texas summer, it tasted like heaven. To this day, my favorite ice cream flavor is strawberry, but, I hardly ever have it. We don’t eat enough ice cream to justify buying it by the half gallon, nor do we need to eat that much ice cream. But every so often, even in Seattle in winter, I crave a little ice cream treat. That’s where my Ninja Professional blender comes in. This blender is honestly my favorite kitchen item, and I came this close to not buying it. For shame! Aside being able to blend the stuffing out of just about anything I want, I can make up a very reasonable ice cream facsimile in less than one minute. No rock salt needed. That’s just plain awesome. In case you are a little odd like me and I like a cold treat on a cold day, here is my berry soft serve creation. Enjoy! Note: You’ll need a high-powered blender like a Ninja, Blendtec, or Vita-mix to pull this off. Add all the ingredients into your high-powered blender in the order listed and blend for about a minute until the mixture is soft serve consistency. 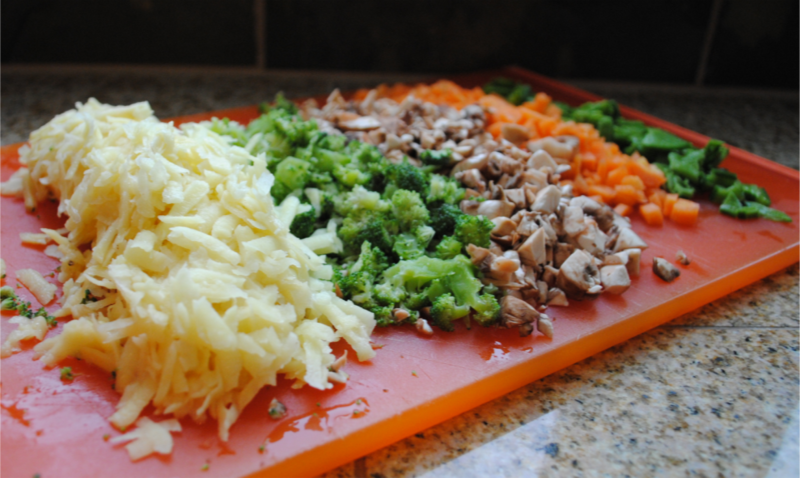 You may have to scrape down the sides once to make sure everything is fully incorporated. The longer you blend, the thicker it will get. I have found the easiest way to scoop the goodness out of my Ninja jar is to use a rice server/spatula thingy. Works great and doesn’t scratch the blender jar. 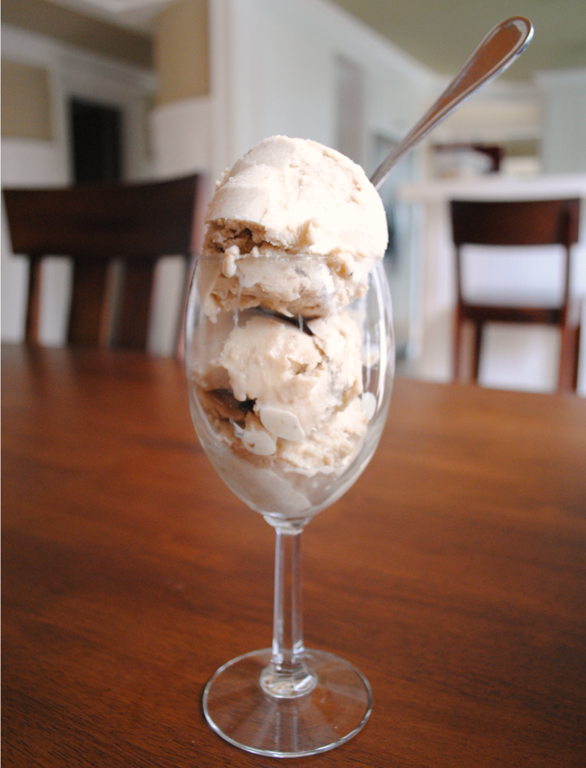 You can also freeze it for a couple hours to get a more frozen ice cream consistency. 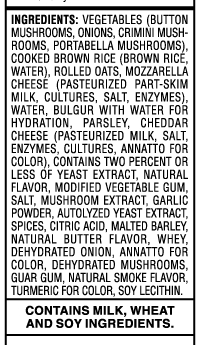 Honestly, there is no ice cream you can buy that has this good of a nutritional profile. With just three ingredients, it’s about as good as it gets!